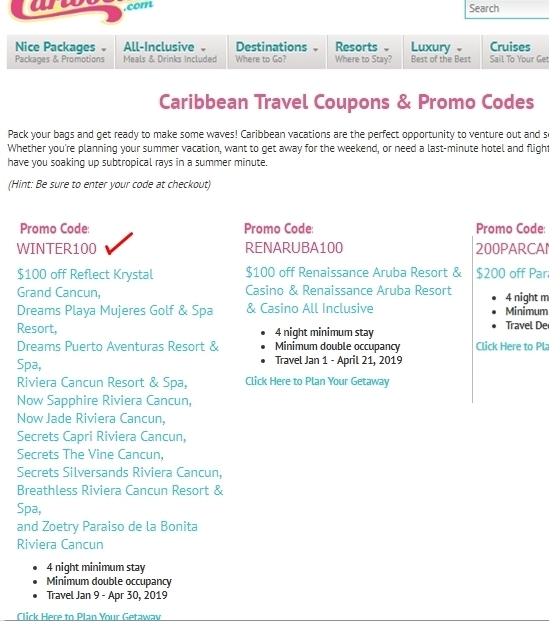 Allen Miller Get $100 Off on Select Resorts at Cheap Caribbean. $100 off Reflect Krystal Grand Cancun, Dreams Playa Mujeres Golf & Spa Resort, Dreams Puerto Aventuras Resort & Spa, Riviera Cancun Resort & Spa, Now Sapphire Riviera Cancun, Now Jade Riviera Cancun, Secrets Capri Riviera Cancun, Secrets The Vine Cancun, Secrets Silversands Riviera Cancun, Breathless Riviera Cancun Resort & Spa, and Zoetry Paraiso de la Bonita Riviera Cancun. Use promo code WINTER100.